Friends, we are living in the what feels like the arctic tundra in central Indiana. We’ve have below zero temps, school delays and cancellations, and the air is as dry as a desert. It’s really not how I prefer to live. This past weekend, school was cancelled Friday, giving the kids a four day weekend since Monday was a holiday. Four days of figuring out inside amusements without giving into their dream of creating their own YouTube station. As it turns out, yes! Basketball Saturday, swimming Sunday and then a Harlem Globetrotters game Monday kept everyone from climbing the walls. The Harlem Globetrotters have made it a tradition to come through town on Dr. Martin Luther King Jr’s birthday and play an afternoon game. This was the first time we’ve been to a game, but it won’t be our last. All four of us were entertained for two hours by tricks, stunts and slapstick comedy, all while watching Indiana’s favorite sport, basketball. We cheered for the Globetrotters and booed for the Generals and laughed and laughed. We saw wild shots from the four point line (yes, the four point line) and more slam dunks than we could count. The Globetrotters tour across the country year round, and are probably coming to a city near you this year. Ready to save money on some tickets? 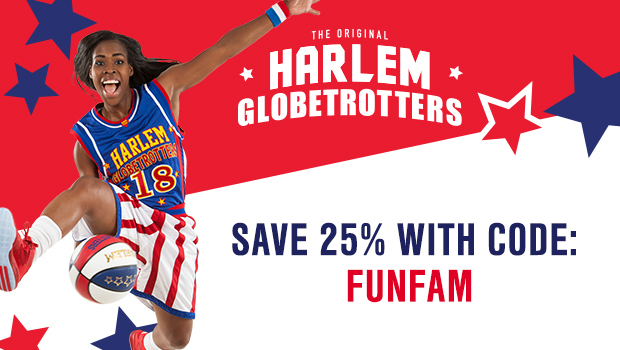 Here’s an offer to save 25%! 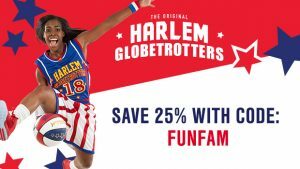 Disclosure: Thanks to the USFamilyGuide & The Harlem Globetrotters for providing tickets to see this game in exchange for my honest review. I always wanted to see this show! The show was ok. Brought my family of 4 (girls are 18 and 22) for $138. HG played "basketball" for 1 hour 35 minutes plus a 15 min intermission where people were buying tons of HG gear. There were a handful of neat plays/tricks/funny antics but I probably could have seen it just as well on youtube! It was also hard to hear what was going on. Glad we got the cheap seats! Make sure you compare discount tickets online vs buying at the gate. We could have saved even more $$ online!